2 piece drawer pullout container box. Sturdy and secure when assembled. Colour : Brown/Kraft. Material : 350g cardboard. We take our reputation seriously. 6x Large Kraft Boxes (18 x 12 x 6 cm). 6x Ribbons (mix of 2 Colours, approx 70 cm each). 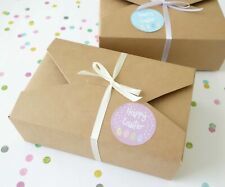 Easter Large Gift Boxes Set. Make your gift wrapping extra special with these Easter gift boxes. I will try my best to resolve any problem. 6x Easter Stickers (2 Colours). 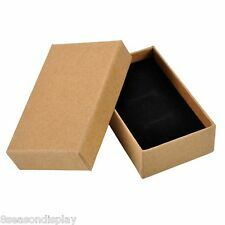 6x Large Display Kraft Boxes (15 x 15 x 5 cm). 6x Purple Ribbons. Easter Gift Boxes Set. Make your gift wrapping extra special with these Christmas gift boxes. I will try my best to resolve any problem. Material: Cardboard. You can choose either one when you checkout. - Color: Brown. 100x Wedding Favours Boxes. Universal Folding Aluminum Tablet Mount Holder Stand For iPad iPhone Samsung OZ. Gorgeous favor boxes for Wedding. Wedding favor boxes for candies or small gifts. We believe every problem can be resolved. Easter Mini Lolly Boxes Set. 12x Cute Mini Kraft Boxes (5 x 5 x 5 cm). 12x Natural Twines (approx 40 cm each). Make your gift wrapping extra special with these Christmas gift boxes. I will try my best to resolve any problem. 6x Large Black Boxes (18 x 12 x 6 cm). 6x Orange/White Twines (approx 70 cm each). Easter Large Gift Boxes Set. Make your gift wrapping extra special with these Easter gift boxes. I will try my best to resolve any problem. 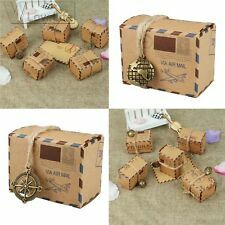 6x BROWN Square Cardboard DIY Kraft Gift Boxes Wedding Party Bomboniere Favour 9x9x9cm. Size: 9x9x9cm. 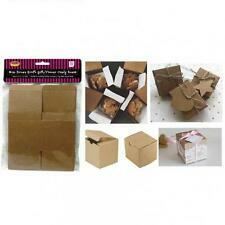 6pcs of Kraft Paper Brown Square Cardboard Boxes. Material: Kraft Paper. Colour: Brown. 12x brown Kraft paper boxes. Made from quality strong 350gsm kraft paper. We'd like to hear from you and help to resolve any of you concern. Boxes only. Gorgeous window boxes for showcasing handmade products, baked goods or confectionery! The boxes will arrive fully assembled, ready to fill and pop the lid closed! Kraft brown with clear window. Side and front tabs to keep lid secure. 4 Holes Cupcake Box without Handel: L x W x H =16x16x7.5cm (350g Ivory board). Colour: White. All the boxes are with PET Clear Film transparent window. Material: White cardboard. Each box includes an insert with recessed space to hold standard cupcakes safely in place. 24x kraft paper boxes. They are perfect to create,decorate and make special gifts. Biodegradable,eco-friendly,grease proof,food safe. Beautiful appearance,look like a heart in love,interesting and inventive. Ideal for Candy,Printed with love, with hemp rope and paper wrap. Its quick and very easy to assemble. It is also a good choice for gifts. Material 250g paper Box size 5*5*5cm Type Favour Bags & Boxes Main Colour Brown Number of Items 100 Size Medium Brand Unbranded/Generic MPN BC608415784081 UPC Does not apply EAN 608415784081. Great to leave like this for a warm, rustic style, or you could easily personalise them with stickers, ribbons for any party occasions. 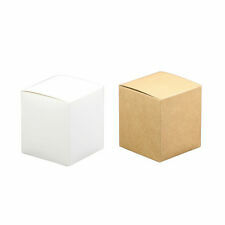 * Gorgeous favor boxes for Wedding * Original boxes are flat but it only takes seconds to assemble. 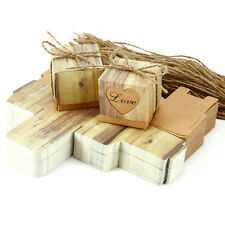 * Wedding favor boxes for candies or small gifts. * Can also be used for other celebrations or collections * Box size: 7 x 7 x 7cm * Pease allow slight color difference due to the monitor resolution and light effect when taking pictures! 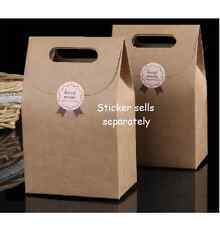 * Package: 100x Wedding Favours Boxes Material Kraft Type Wedding Sub-Type Favours/ Gifts Color Brown Pack 100pcs Brand Unbranded MPN Does Not Apply UPC Does Not Apply EAN Does Not Apply. Gorgeous favor boxes for Wedding Original boxes are flat but it only takes seconds to assemble. Small square kraft gift boxes, for use as wedding favours, chocolates and soap to name a few uses Can also be used for other celebrations or collections Box size: 7*7*7cm Comes with string and tags Pease allow slight color difference due to the monitor resolution and light effect when taking pictures! Package: 50 x Wedding Favour Boxes Material Kraft Type Candy/Gift box EAN Does not apply Number of Items 50 Color Brown ISBN Does not apply GTIN Does not apply Brand Unbranded MPN Does not apply UPC Does not apply. Gorgeous favor boxes for Wedding Original boxes are flat but it only takes seconds to assemble. Wedding favor boxes for candies or small gifts. Can also be used for other celebrations or collections Box size: 5 x 5 x 5cm Pease allow slight color difference due to the monitor resolution and light effect when taking pictures! Package: 100x Wedding Favours Boxes Material Kraft Type Candy boxes Sub-Type Wedding Favours/ Gifts Color Brown EAN Does not apply GTIN Does not apply ISBN Does not apply Brand Unbranded MPN Does not apply UPC Does not apply UPC Does not apply. 2 piece drawer pullout container box. Sturdy and secure when assembled. Colour : Brown/Kraft. Material : 350g cardboard. We take our reputation seriously. Simple assembling will be required. 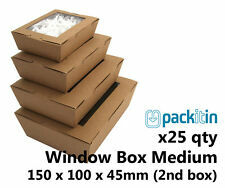 6x Large Display Kraft Boxes (15 x 15 x 5 cm). 6x Christmas Stickers (2 Designs). 6x Red & White Twines. Make your gift wrapping extra special with these Christmas gift boxes. Christmas Cookies/Macaron Large Boxes Set. 10PCS Simple Favor Gift Paper Candy Boxes Kraft Baby Shower 3.5"x2.5"x0.9"
Often used as wedding favour boxes in place of traditional favour bags, kraft boxes are a durable and sturdy way to give trinkets and food items to wedding guests. Versatile and simple to customise, a wedding gift box comes in numerous sizes and types to meet every need, whether you're handing out candles or chocolates. What Are Some Kraft Box Types? Kraft boxes are wedding items that come in multiple types depending on the purpose for which you're using them. There are solid boxes that work well for non-perishables, as well as boxes with open windows or cutouts that allow guests to view what's inside, which is recommended for pastries or candies. Some boxes have a carrying handle, and some have an attached lid or a removable lid. Not just limited to brown, you can select kraft boxes in colours like pink, blue or green. Pillow boxes are good for small items, and kraft cones hold flowers and bouquets. What Other Supplies Complement Kraft Boxes? Personalise your kraft boxes with wholesale wedding supplies, such as burlap twine to secure boxes shut and blank or decorated gift tags to which you can add the bride and groom's names or the wedding date. Embellish kraft boxes with stickers, stamps or charms you can slide onto the twine, or add doilies to the tops of boxes for a shabby-chic look.